The South African Krugerrand Gold Bullion Coin is credited with being the first bullion coin in the world created solely for investment purposes. It first appeared in 1967 as a means of marketing gold mined from massive deposits in South Africa. Experts estimate that the Krugerrand proved so popular that within fifteen years the strike accounted for 90% of the gold coins held by private individuals. It also spurred the introduction of gold bullion coins from other world mints including the Gold Maple Leaf from the Royal Canadian Mint and the American Gold Eagle from the United States Mint. Shown on the reverse of the coin is an image of a springbok antelope. The creature is surrounded by the inscriptions of "KRUGGERAND," the year of minting and the gold weight of the coin. When first issued in 1967, the Krugerrand only appeared in the one ounce size. The intention was for the strike to actually serve as currency so it was minted from 22-karat gold which is more durable than pure gold. The South African Mint kept with that composition through the years despite other world mints opting to mint their gold bullion coins from a .9999 fine composition. Still, a one ounce Krugerrand does actually contain one ounce of gold with its total weight being slightly more than that to account for the added copper. The fractional Kruggerands were added in 1980. 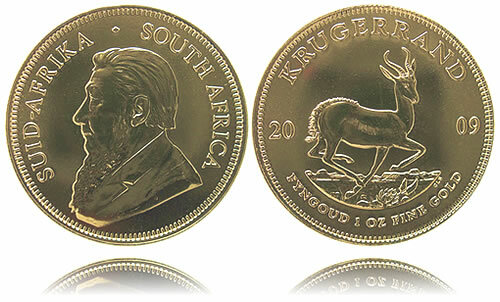 In total, it is estimated that almost 50 million ounces of gold have been struck as Krugerrand Coins.